New Delhi, March 19: Chief Election Commissioner (CEC) Sunil Arora along with Election Commissioners Sushil Chandra and Ashok Lavasa on Tuesday met representatives from various social media platforms to discuss issues related to social media content post implementation of the Model Code of Conduct. Lok Sabha Elections 2019 Schedule: Voting In 7 Phases From April 11 to May 19, Counting And Results On May 23; Check All Dates For General Elections. The Election Commission of India on March 10, 2019, announced the dates for the Lok Sabha Elections 2019 and the model code of conduct came into immediate effect with the announcement of poll dates. Lok Sabha Elections 2019 Dates Announcement by ECI Highlights: Mumbai Votes on April 29, Delhi on May 12; Check Constituency-Wise Voting Schedule. See pictures from the meeting of the Election Commission with social media representatives tweeted by news agency ANI in the tweet below. 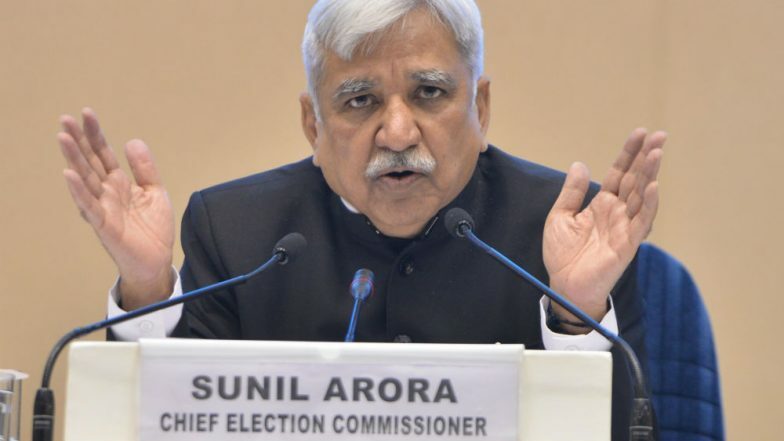 At the time of announcement of the schedule for the Lok Sabha Elections 2019, Chief Election Commissioner of India (CEC) Sunil Arora mentioned a number of new measures that the EC had decided for free and fair elections. It mentioned that trying to regulate fake news and hate messages on social media are one of the concerns for the Election Commission. Voting for the national polls will be held in seven phases from April 11 to May 19. The counting of votes will be held on May 23. Voting for the Lok Sabha Polls will take place on both Electronic Voting Machines (EVMs) as well as VVPAT machines at all polling booths.